The San Diego Sheriff‘s long-standing policy for deciding whether a citizen can carry a concealed firearm in public was confirmed by the Supreme Court’s decision not to review the issue. 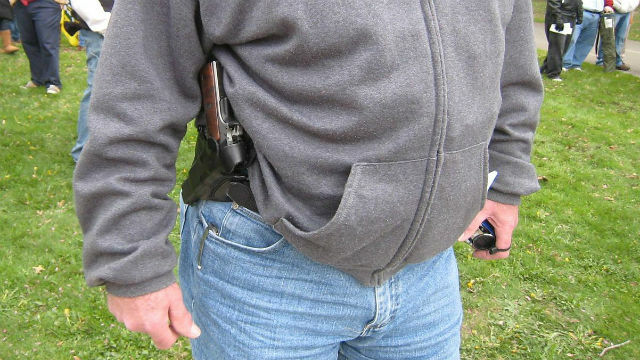 The justices on Monday let stand a lower court’s ruling upholding the policy of denying such permits unless the gun owner can demonstrate a “good cause” for carrying a concealed weapon. “Based on the Supreme Court’s decision today, the ruling by the 9th Circuit Court of Appeals will stand and the procedure of obtaining a license to carry a concealed weapon within the County of San Diego will continue as it has since the 1980s,” said Sheriff William Gore in a statement. Gun rights advocates decried the decision, arguing that anyone who passes a background check should be able to carry a concealed weapon in public. “We implore Sheriff Gore to think of the safety of his constituents and change his ‘good cause’ policy to one that is more accepting and inclusive so that San Diegans can exercise their rights to defend their life and dignity,” said Michael Schwartz, executive director of the San Diego County Gun Owners PAC. San Diego’s policy requires county residents to demonstrate “good moral character” and “good cause” and complete a training program in order to obtain a permit. The lead plaintiff in the long-running case, San Diego resident Edward Peruta, applied for a concealed carry license, but was rejected because he had not specifically shown he was in harm’s way. Peruta and four others sued San Diego County in a case backed by a California affiliate of the National Rifle Association. The state intervened in support of the county. Two conservative justices, including President Trump appointee Neil Gorsuch, said the court should have heard the case.